Hmmm. 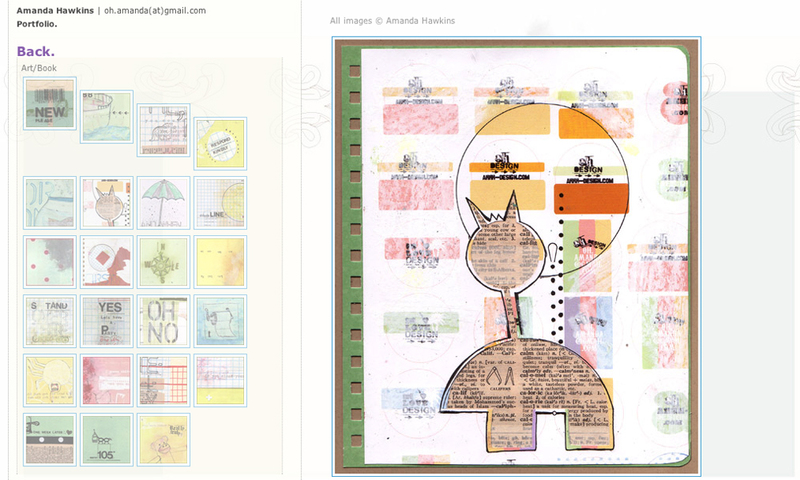 A quick blog post just turned into an all night redesign session on my website. 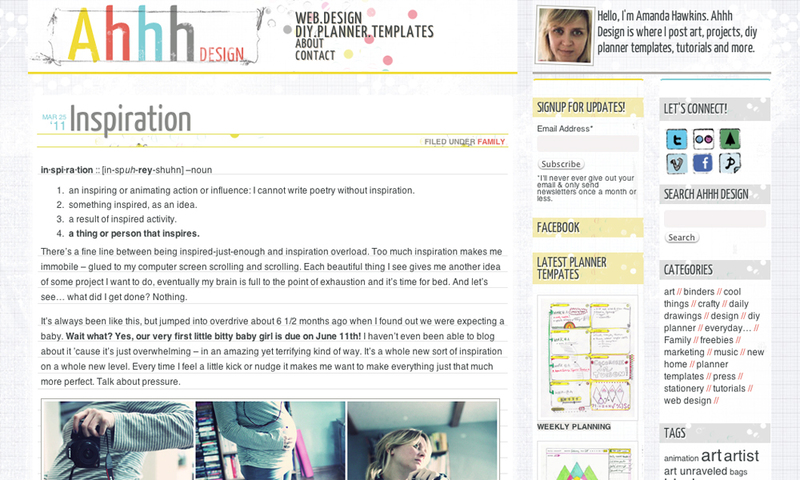 I decided Ahhh-Design needed a bit of a refresh – surprise! Then I started wondering about all the hundreds of *refreshes* Ahhh Design has had over the years, little changes here and there. Below are some screenshots of the major changes. 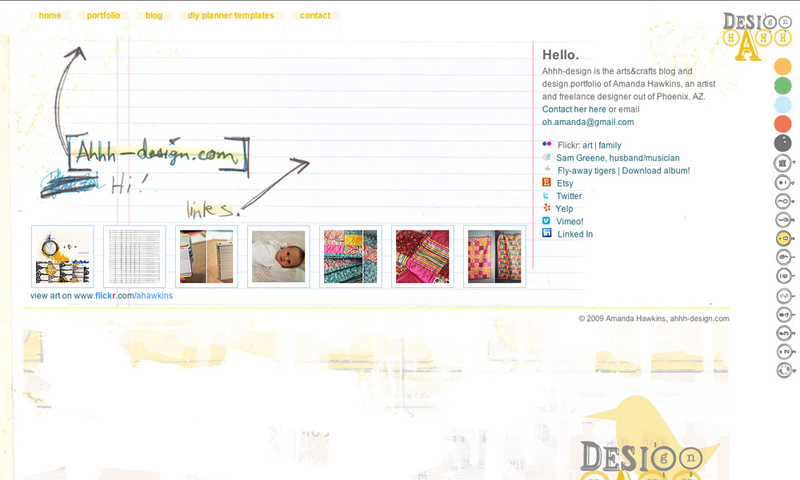 I bought the domain ahhh-design.com in 2005 to build a design portfolio to go along with my resume. My husband, then just a friend, helped me with the portfolio functionality and I hacked and hacked away at the CSS until it looked how I wanted it. 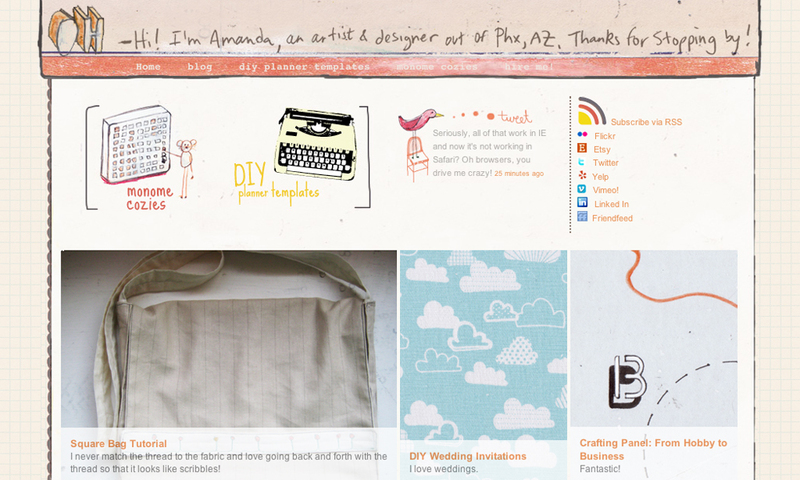 It stayed a portfolio until 2008 and blogging was really starting to take off for crafters. 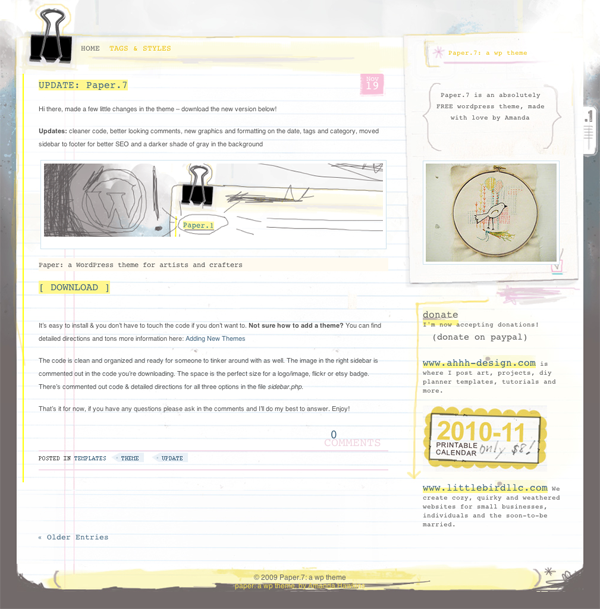 I’d had a Livejournal account for a few years but thought it was time to take the plunge! 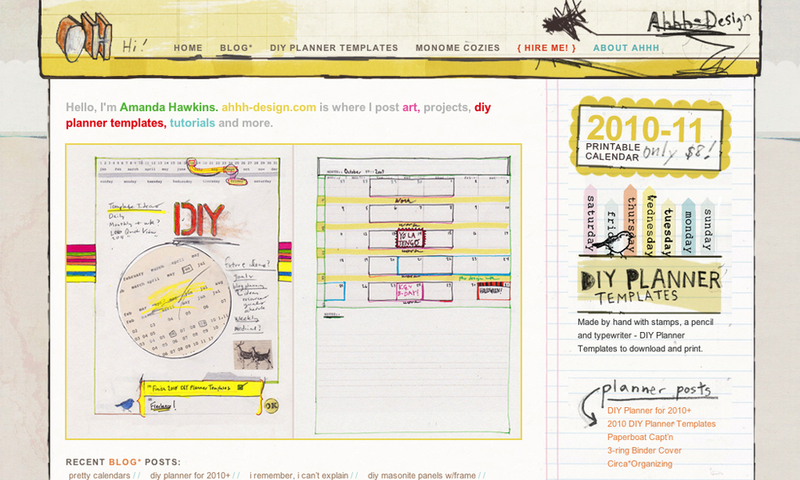 My DIY planner templates were also getting more popular and I wanted a place to organize them. 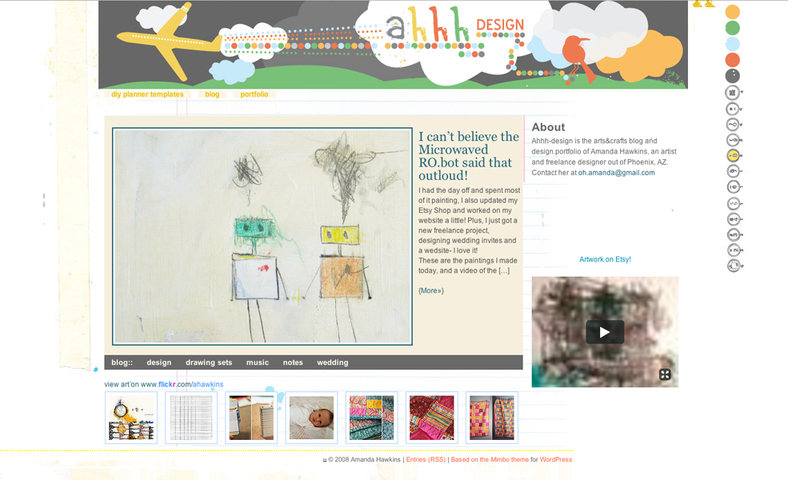 First, I tried using the blog engine Chyrp. I ended up on WordPress though because of the large and very supportive community – great for someone just learning. 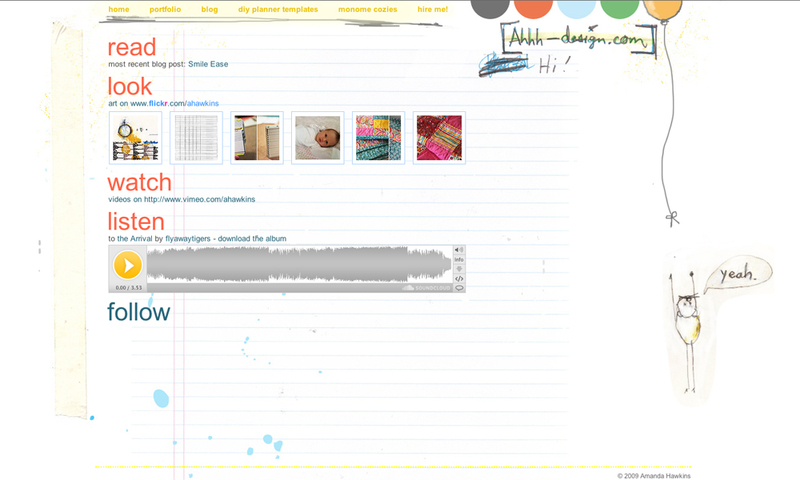 This was my 3rd WordPress theme customization, my first was in 2007. 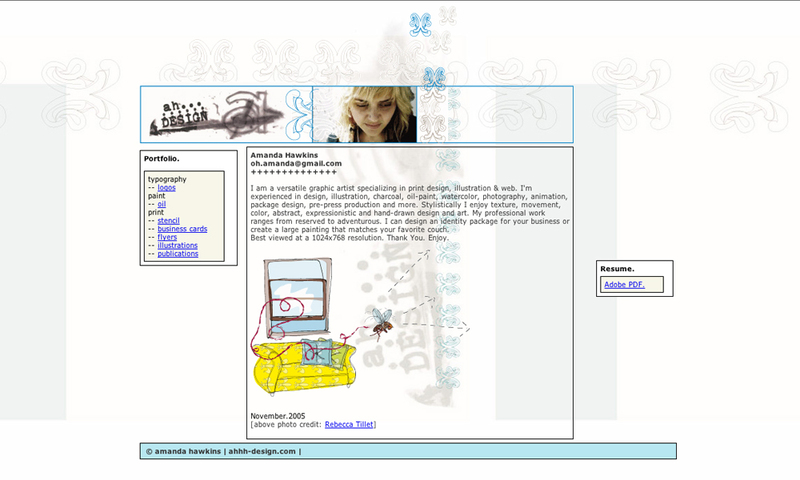 I also started working part-time for a web design firm in Jan of 2008 and was getting more and more comfortable with html/css and slicing up artwork. 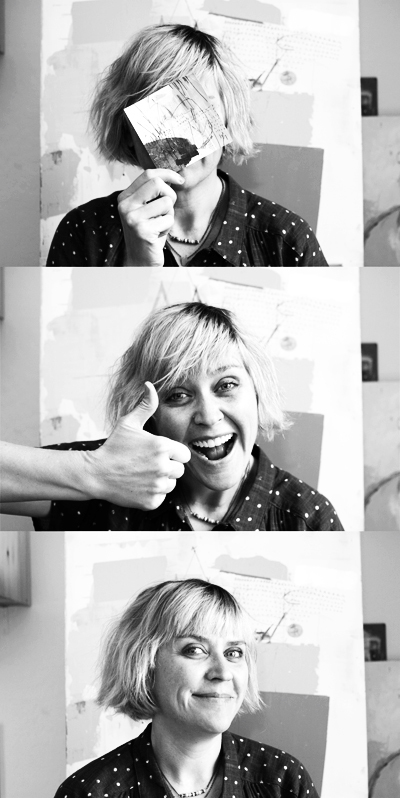 I’ve always tried to not take this site too seriously, so it’ll stay a fun creative outlet. I make changes live so you might even stumble upon it looking like a total mess. As you can tell by these next screenshots, haha. At this point I ditched Mimbo, the theme I’d learned on, for a new one. I wish I could remember the name… it’s heavily customized and doesn’t look much like the original. 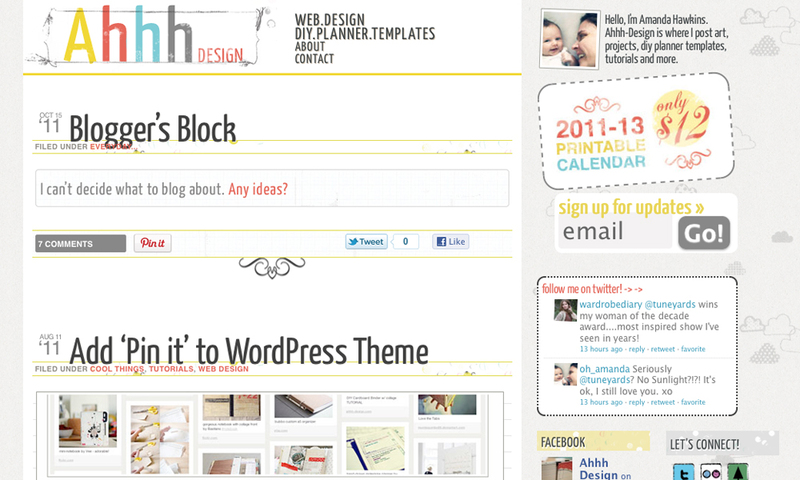 I was feeling much more comfortable with WordPress at this point and had created my first free theme for download! And that leads us to today, the first refresh of 2012! May there be many, many more. Thanks for reading, xoxo. I got the above stencil from Sam for christmas, awesome! 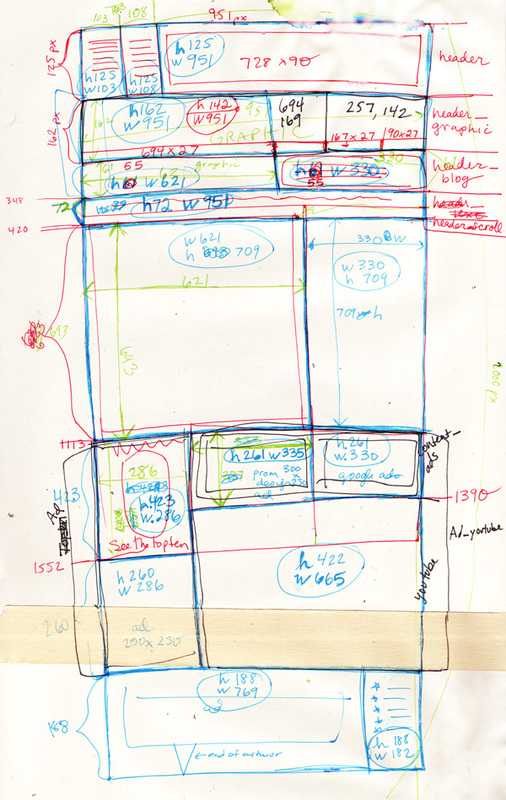 Researching wireframing techniques now, trying to get in web designing mode for a top secret project coming up in the next couple of months. 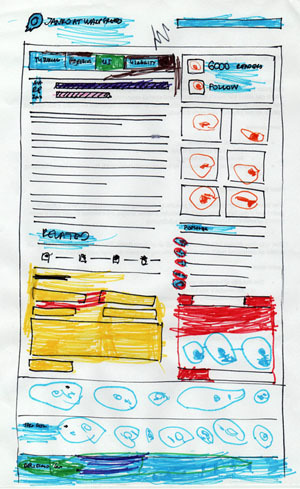 The JAWS wireframe (left) is the most inspiring so far, by a four year old! Updates include cleaner code, better looking comments, new graphics and formatting on the date, tags and category, moved sidebar to footer for better SEO and a darker shade of gray in the background. 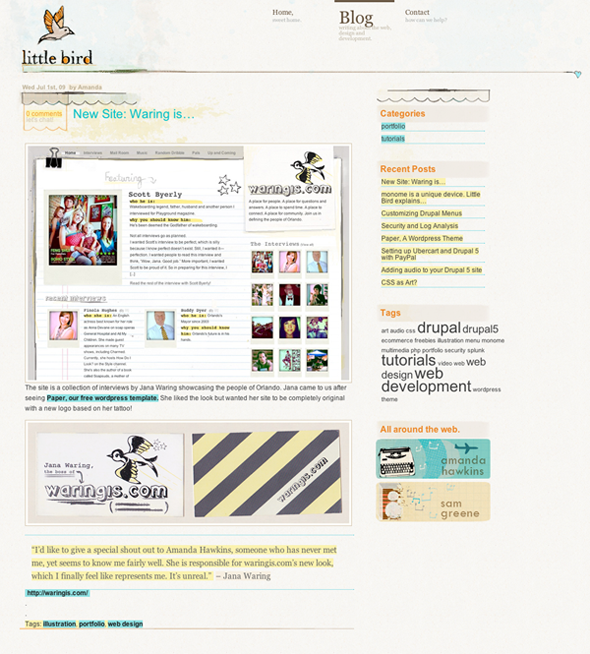 I’ve been working on littlebirdllc.com since last fall. 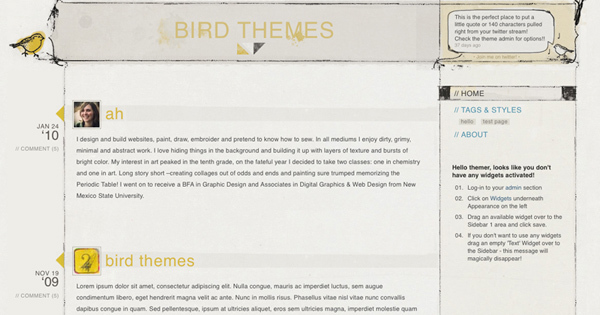 Designed 10 different versions, coded about 6, started in Drupal and ended with WordPress. 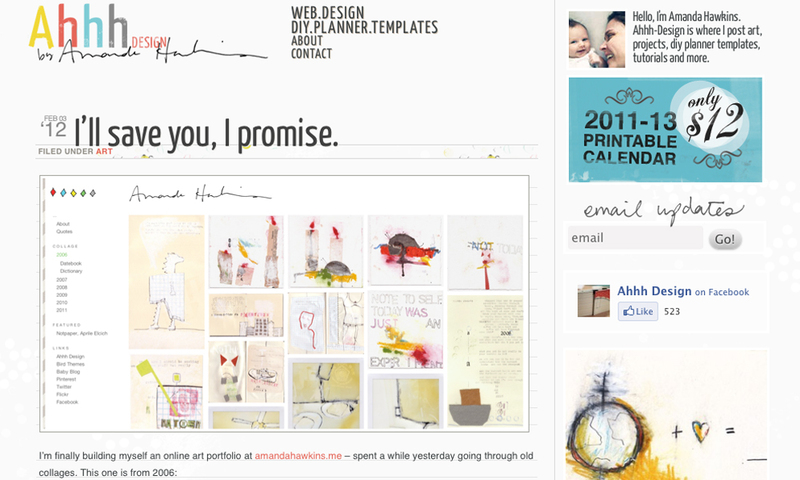 Do all designers have such a hard time designing their own business sites? It’s just never right, never cool enough, never finished. I decided on Saturday that this had gone on TOO long. Imagine my surprise when I actually came up with a design I liked right after deciding I just wanted to get something up? Design is funny like that. It’s still a work in progress, but it’s something. Thanks for reading! I spent about a million hours working on our wedsite, I’ve realized in the last couple of weeks that I might like making blogs more than I am like writing in them.